Jermaine grew up in the Old Kingdom. His tribe of mighty minotaur has made its presence known to many of those inhabiting the southern region of Old Kingdom. Things were great. Trolls, ogres and orcs respected the power of the tribe and the power that an allegiance would bring to these races. 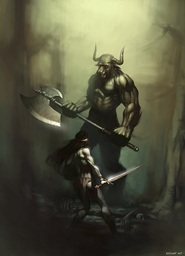 Unfortunately the minotaur tribe is a traveling barbarian group that grazes from place to place and their relations with these other groups are little more than informal friendship, although if push comes to shove the tribe will back those who oppose their allies. As Jermaine came of age he was asked to go on his journey towards full-fledged member of the tribe. The requirement of this is to bring something of value back to the tribe. Unfortunately the values of the tribe differ completely from the values of the civilized world. So Jermaine left in search of something mighty to return to the chieftain. This was where he took a few wrong turns and ended up in Tolosonya. It was here that he was coerced into going to an arena game. The only problem was that the person who encouraged him to go forgot to tell him where the entrance was. Asking around Jermaine found his way in, but the route he took was that of the gladiators about to fight. As the wolfen shoved weapons into his hands and armor on his back, they then asked him if he worshiped a god. Jermaine was confused so they put a picture book in front of him and he picked out the most interesting god to him. He chose Bennu. Afterwards he was pushed into the center of the arena. The crowd began chanting instantly and they have not stopped chanting since and it has now been over five years. Jermaine currently has a restaurant named after his arena name and has gained quite a following. 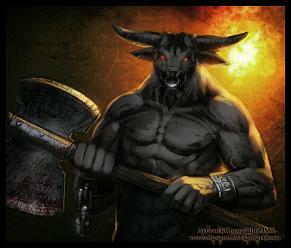 The wolfen of the Northern Wilderness come from far and wide to see the blood lust of the mighty minotaur. 1st Level- Dead or deformed tree, standing alone. Negative. Set of winter clothing, set of summer clothing, fur cloak w/hood, boots, gauntlets, bedroll, backpack, 2 large sacks, 2 small sacks, water skin, 50' rope, 2 weeks food rations, tinder box. As Jermaine came of age he was asked to go on his journey towards full fledged member of the tribe. The requirement of this is to bring something of value back to the tribe. Unfortunately the values of the tribe differ completely from the values of the civilized world. So Jermaine left in search of something mighty to return to the chieftain. This was were he took a few wrong turns and ended up in Tolosonya. It was here that he was coerced into going to an arena game. The only problem was that the person who encouraged him to go forgot to tell him where the entrance was. Asking around Jermaine found his way in, but the route he took was that of the gladiators about to fight. As the wolfen shoved weapons into his hands and armor on his back, they then asked him if he worshiped a god. Jermaine was confused so they put a picture book in front of him and he picked out the most interesting god to him. He chose Bennu. Afterwards he was pushed into the center of the arena. The crowd began chanting instantly and they have not stopped chanting since and it has been over five years. Jermaine now has a restaurant named after his arena name and has gained quite a following. The wolfen of the Northern Wilderness come from far and wide to see the blood lust of the mighty minotaur. Jermaine was born under the sign of Aster the Centaur. Those born under this sign are free spirits who do not like to be tied down. They crave the road and adventure, and have an insatiable curiosity. Aster is also the patron of the bow.